26 n Performance & Hotrod Business n March 2015 Engines & Featured Vehicles While all the details were still being worked out at press time, builders will not want to miss Performance & Hotrod Business' Technical Contributor, Mike Mavrigian, who will be on hand to explain the processes involved in recent engine builds that will be on display in the Performance & Hotrod Business/Restyling & Truck Accessories booth during the show. A number of cutting-edge vehicles will also be on display throughout the exhibit hall to illustrate how custom shops have made use of various products (as well as to show off the creative side of the cus- tom automotive business). For example, Hammerhead Armor's "Project Armament" is a 2015 Ram 2500 Mega Cab featuring a number of premium products including Hammerhead Armor Pre-Runner front bumper, Hammerhead Armor rear bumper and Hammerhead Armor running boards. CSC Customs of Baton Rouge, Louisiana, did the complete build. Also look for a Jeep Wrangler and a Chevy Silverado on display in the Meyer booth—as well as an ATV that will be given away during the show. A gooseneck trailer will be on hand in the B&W Trailer Hitches booth to dem- onstrate how heavy-duty hitches are a solution for builders who use larger trail- ers to transport project vehicles. B&W will be displaying gooseneck, fifth wheel and receiver hitches, all of which present an alternative to shops that transport project vehicles. "We see a lot more people traile- ring rather than driving their expensive cars," says B&W's National Sales Manager James Works. "The trend is toward bigger trailers. They want their cars enclosed, and a bumper hitch is not enough anymore; they need to go to these gooseneck trailers." Show Specials Exhibitors often plan exclusive show specials on certain lines of products or to promote products to the industry. For example, Hammerhead Armor says Authorized Dealers can save big if they sign up during the show. All Authorized Dealers with Hammerhead Armor are given a pro- tected territory. Hammerhead's Dealer Display includes current-model front bumpers (pre-runner or full brush guard style), rear bumper and running boards. Meyer Distributing's Gramelspacher says the company's ongoing eMeyer Mega Show Specials, offering 5-10 percent off everyday pricing on selected lines, will end at the close of THE SHOP SHOW. But there are potentially many more exclusive show opportunities that go unannounced until the show and become known only to those who attend. New Products on Display "The Shop Showcase" will highlight featured products being offered to the professional custom automotive aftermar- ket, it was announced recently by show management. 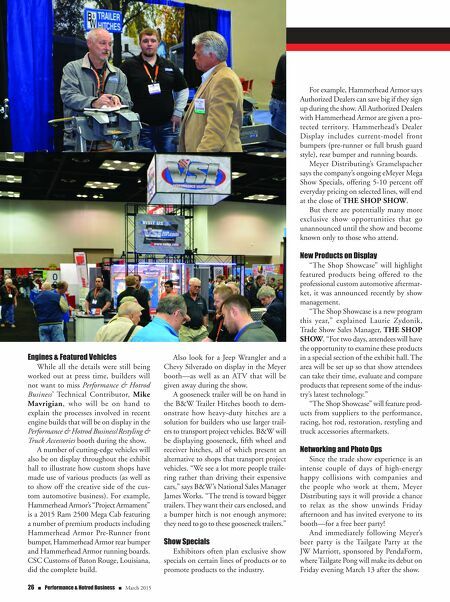 "The Shop Showcase is a new program this year," explained Laurie Zydonik, Trade Show Sales Manager, THE SHOP SHOW. "For two days, attendees will have the opportunity to examine these products in a special section of the exhibit hall. The area will be set up so that show attendees can take their time, evaluate and compare products that represent some of the indus- try's latest technology." "The Shop Showcase" will feature prod- ucts from suppliers to the performance, racing, hot rod, restoration, restyling and truck accessories aftermarkets. Networking and Photo Ops Since the trade show experience is an intense couple of days of high-energy happy collisions with companies and the people who work at them, Meyer Distributing says it will provide a chance to relax as the show unwinds Friday afternoon and has invited everyone to its booth—for a free beer party! And immediately following Meyer's beer party is the Tailgate Party at the JW Marriott, sponsored by PendaForm, where Tailgate Pong will make its debut on Friday evening March 13 after the show.